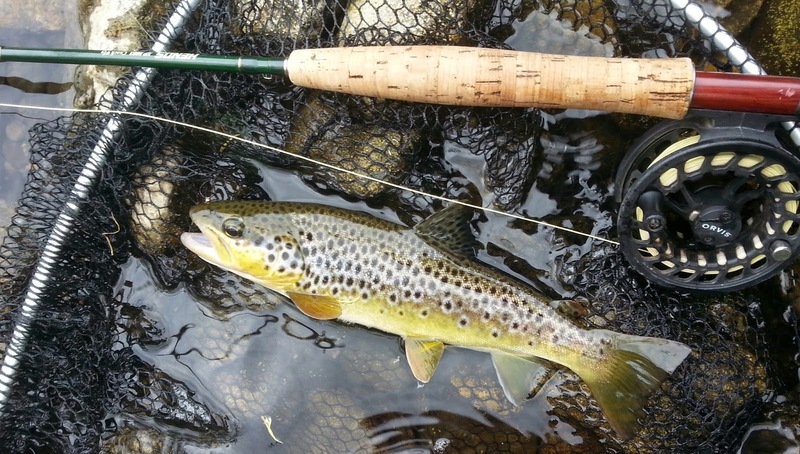 Over the last few seasons the popularity of The Perdigon Nymphs has be growing on Irish rivers. Perfected by Spanish anglers they are a relatively simple nymph that are renowned to cut through the water and entice stubborn trout to a take. 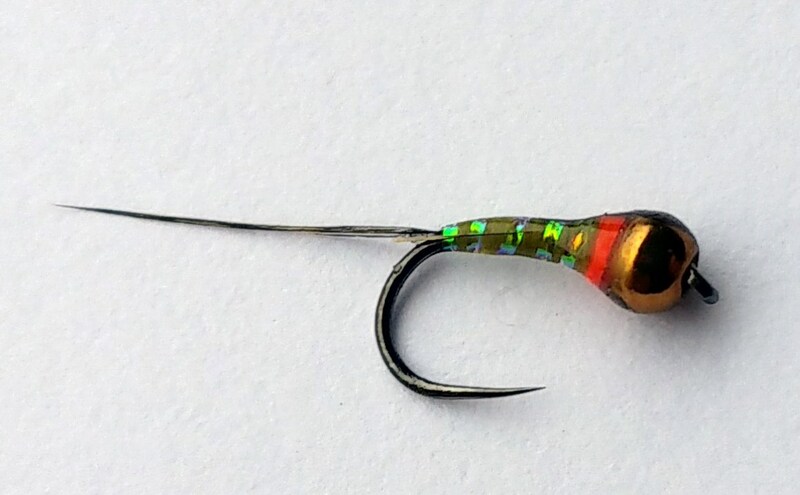 The sleek design of the nymph offers little or no resistance when it enters the water till it hits the bed of the river and this is a key factor when tying them. 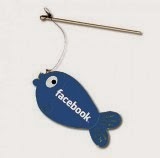 It's common characteristics include a good sized tungsten bead on a small hook, the tail is commonly some Coq de Leon. The body can be made up of pretty much any thread, tinsel or fine floss that suits your desired look and retains the slim profile of the nymph. Coated in a good coat of UV resin the final touch is a black hot spot placed in the thorax area of the fly, commonly used for this is a good permanent black marker. You can put another coat of UV resin over this spot to increase it durability but adding this before the first coat could mean the black running through the thread or tinsel body. Developed by the Spanish the best part of a decade ago, they were crucial in catching fish in fast water. They break that surface current quickly and with little resistance in there make up the current finds it hard to drag the nymph away. Another component to its effectiveness is fine strong tippet so this also can not be dragged by the current. Unlike other nymphs the Perdigon is not designed to have movement and they can be very effective fishing on heavily fished water with stubborn fish. 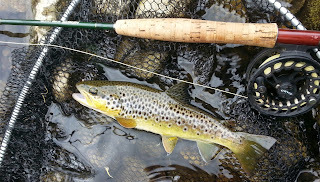 Also after you have gone through your beat with other nymphs and picked off what fish you can; another run through with these perdigon could produce some extra scores on your card. This type of water on the right is ideal for this style of nymphing with higher than normal levels and a strong surface current you will something that will cut through that current before it sweeps your nymphs away. While large beads and heavy nymphs will also do the job the fish might not be willing to take them and want something a bit smaller and sleeker. Here is some different combinations of these nymphs that I have found to be productive I hope you enjoy them. 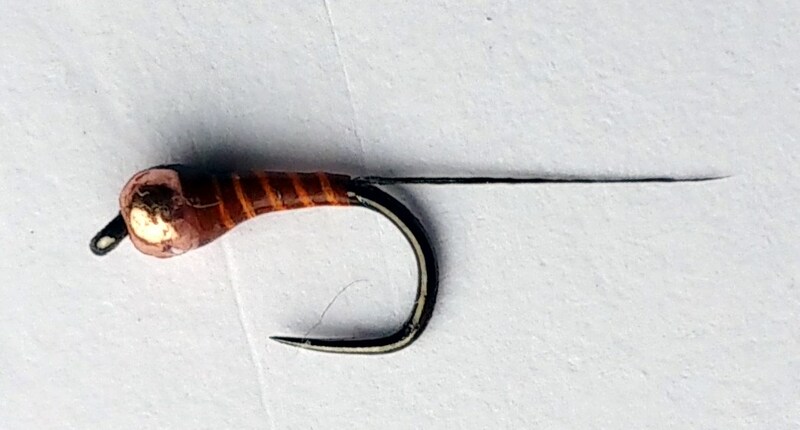 All the nymphs are tied on Dohiku Barbless hooks either 301's or 303's. 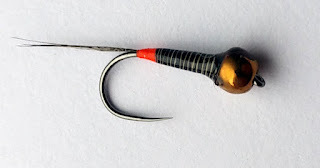 you also can add a little extra weight by adding a turn or two of flat lead behind the bead before tying in your thread. 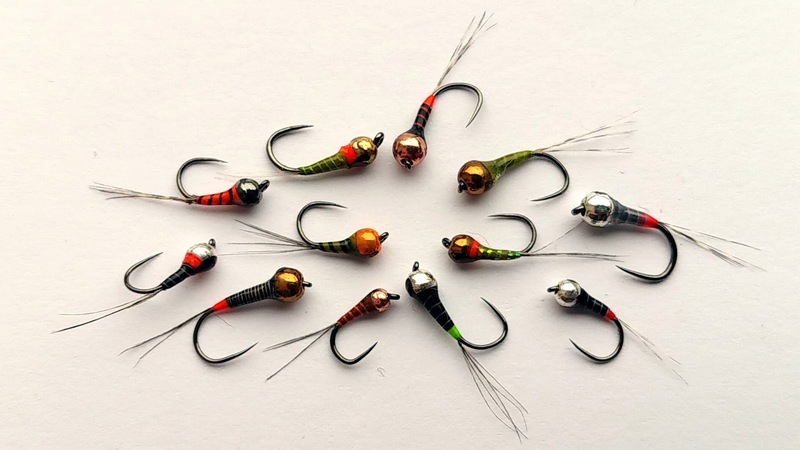 I hope you enjoy fishing and tying these nymphs and thanks for reading my blog, if you would like any other information please feel free to drop me a line on my contact details here and if you are looking for Dohiku hooks or top quality Tungsten Beads feel free to give me a shout for the best prices. If you would like any of these or other patterns tied my contact details are on the right of the page. Excellent Article Peter,Thank you very much for sharing. copper bead, brown body and orange rib? Hi The tying is just that I use a fine UV reflective floss from Tommyfly for all this style of tying and it comes in a bunch of colours so i just use the brown as the base colour and rib it with the orange is all. I really appreciate your info. Tight lines Peter & Thank you very much!!! These are like gems, absolutely beautiful! Peter, what uv resin would you recommend for body applications? Any source of good product in Ireland?